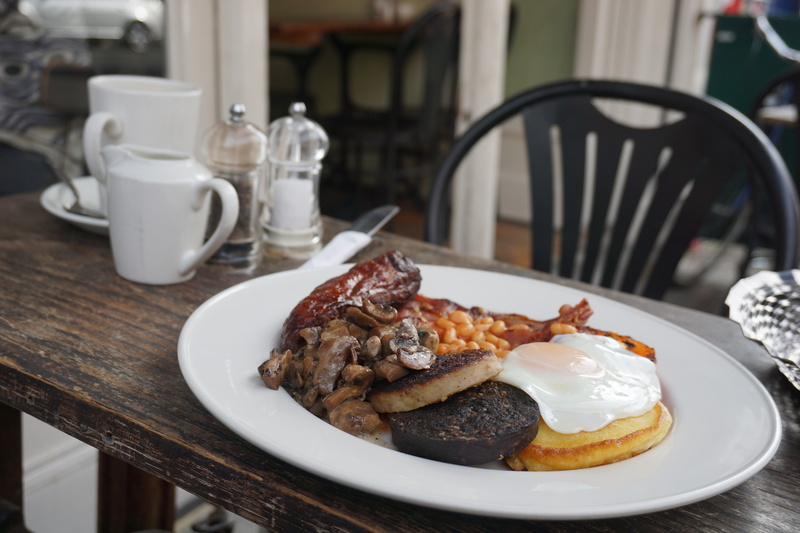 As a tradition, I treat myself to a full Irish breakfast every Saturday at the neighbourhood caff. It just so happened that on one fateful Saturday I actually was in Ireland, Dublin to be specific. I was spoilt for choice really; expectedly ever second cafe I passed claimed to serve the best breakfast in town. While I’m sure all their claims are legitimate, I think I may have chanced upon the winner of the title ‘Best Breakfast in Dublin – Hipster’s Choice’ – unless of course said hipster is vegan. To start with, I was tickled pink at the idea of sitting to eat at a sewing machine! Ambitiously, I ordered the Big Breakfast, knowing full well that I’d be served enough food to feed a small village. In the calm before the storm, I sipped on some strong black coffee and had a chance to Dublin’s early morning rituals. Located on North Frederick Street, Lovinspoon is a short walk away from where the hen parties hang out, so you get a glimpse of the real city – children being dragged to football practice, men heading to the barber’s and a pair of old ladies out for their weekly shop. Just as I began to loose myself in idle observation the waitress walked out with a plate that explained her robust biceps. 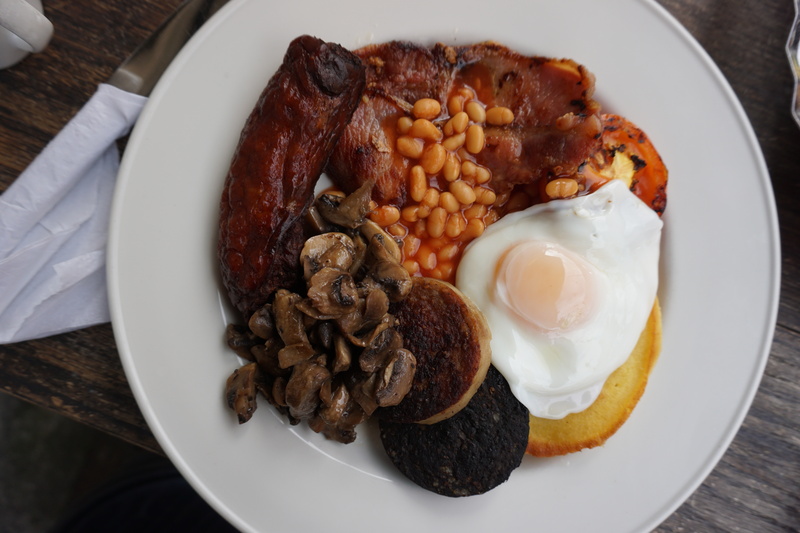 Sausage, black pudding, white pudding, bacon, beans, mushrooms, grilled tomato, a pancake, a fried egg and toast. My favourite bit, was actually the pancake; best darn pancake I’d had in a long time! 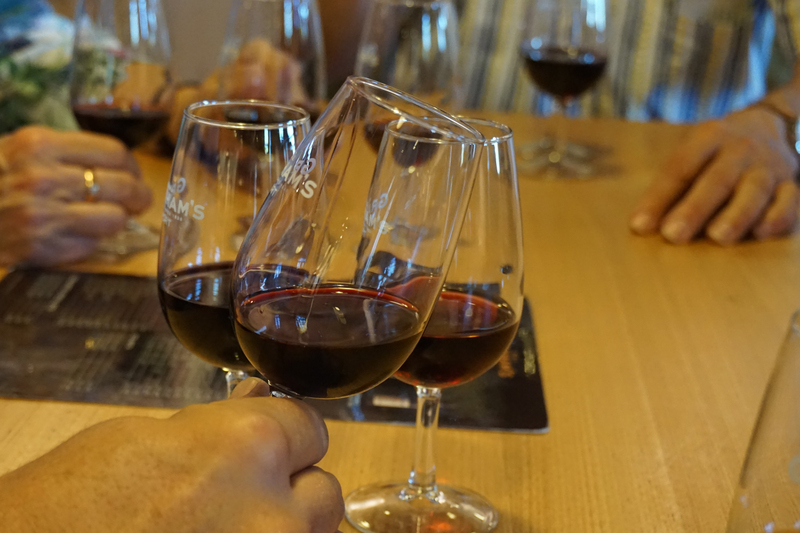 Apparently, you can’t call it Port wine if it doesn’t come from Porto. Just like you can’t call it Champagne if it doesn’t come from Champagne. Pardon my ignorance, but I didn’t know this until I visited Porto this month. You see, we make port wine in Goa, and have absolutely no qualms what so ever about calling it just that. But then again, about 80% of the Goan population never mentally or emotionally left Portugal so I’m sure the kind Portuguese don’t mind. 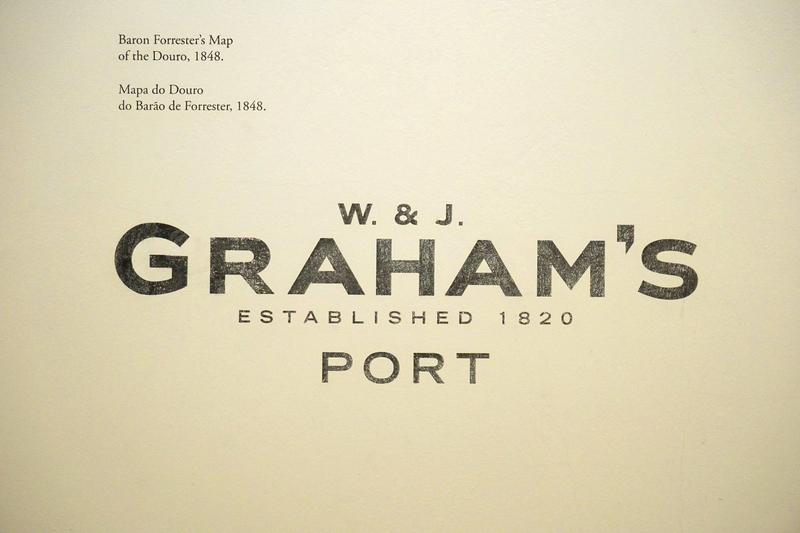 Seeing as I was in the birthplace of port, I indulged in a little educative excursion to Graham’s wine cellar – one of the oldest and most popular manufacturer’s of port wine. Like most it’s competitors, this one has always been run by a British – who can be credited for the mass production and world-wide distribution of Port wine. The wine trade is a thing of pride, and is treated such by all those involved, as is apparent the minute you step into Graham’s museum-esque lodge, which is perched on the slopes of Gaia and overlooks the Duoro. 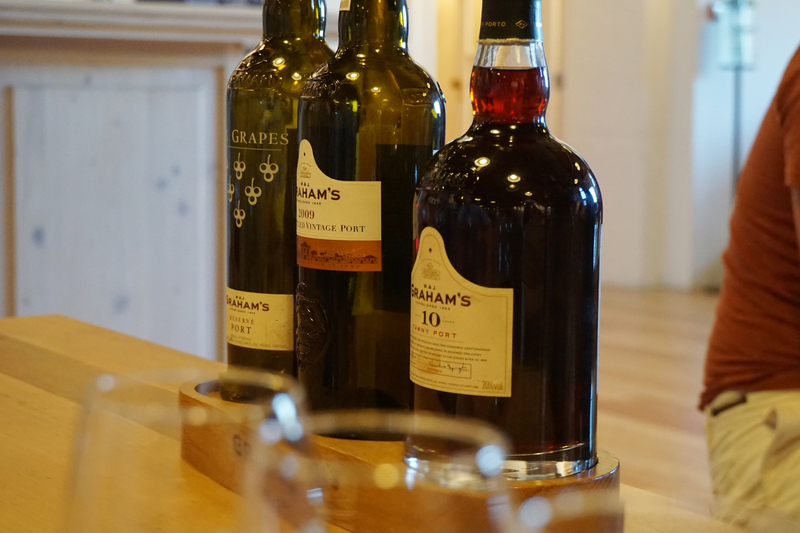 A very humble sum of €8 will get you a pleasant hour-something long experience – which begins with an introductory film about the history of the trade and the owners of Graham’s, which is followed by an explanation of how port is made, a walk through the underground cellar and a tasting of three different port wines. The tour was just informative enough for me to feel like I learnt a thing or two – I can now tell a vintage from a tawny. Just when I started to lose interest, three generously filled glasses of port were presented to me, allowing me to fully apply the theory I had learnt – the downing of every last drop and the slight slurring that followed was really just educative. You haven’t really been to Porto if you haven’t eaten a Francesinha; which translates to ‘little french girl’. Mon Dieu! It surprises me the French haven’t raised objection yet. As the story goes, a dear ol’ chap named Daniel da Silva returned to his hometown Porto after living in France for a while, and in a moment of epiphany, put together an adaptation of the famed French croque-monsieur; a very loose yet ingenious adaptation. The only similarities between the two sandwiches, is that they both have ham, cheese and bread. 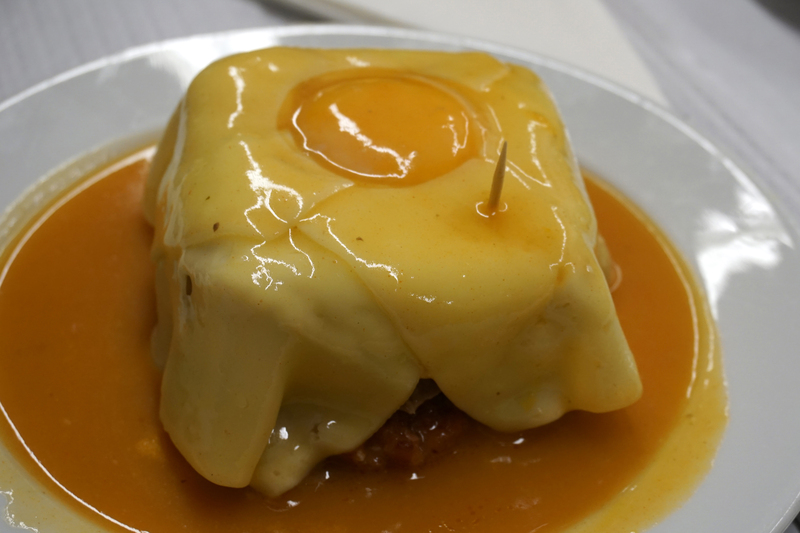 In every other way, the Francesinha is about as French as the Queen of England. Anyway, coming back to the sandwich at hand, it’s a multi layered masterpiece, made with thick slices of bread, ham, linguiça (which is a type of cured sausage or chouriço), fresh sausage,steak and cheese; which covers the sandwich like fondant a wedding cake. And if that in’t enough, you can have a fried egg on top. 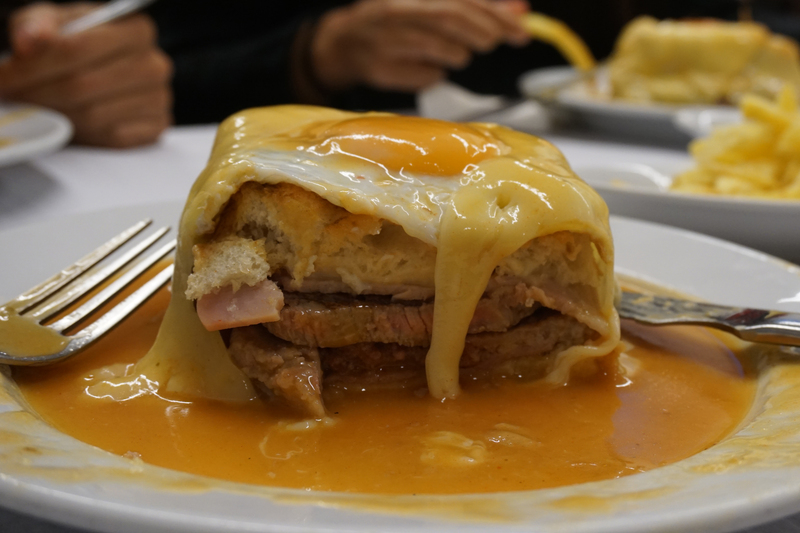 What really brings it all together is sauce, which makes or breaks a Francesinha. They say the original recipe of the sauce is a mystery, perhaps a really well kept secret. Each chef makes his/her own interpretation using the essential ingredients – beer and tomato. Typically the dish is served with a generous helping of fries, but we just ordered a portion of fries among three ’cause we simply didn’t dare. I think it’s the sort of sandwich a sailor could eat before going out to sea, knowing rations for the next few months would be limited. I think, a couple of weeks on, I am still burning some of the calories I consumed that night. But would I eat a Francesinha again? I most certainly would. When in Porto, I recommend visiting Cafe Santiago for Francesinha. You may have to wait for a table, ours took an hour, but it was totally worth the wait! I’ve come to believe that the best coffee shops and eateries are those with grumpy staff that can’t be bothered with niceties. Take for example Kyani’s in Dhobi Talao, where the cashier never returns your smile, I’ve tried. Or Maggie’s in Lewisham where you’ll be yelled at for ordering a single egg, ’cause “who eats just one one a weekend”, true story. Or Cafe Bonsle’s in Panjim where you’re tea is tossed your way, never mind a fourth of it falling out. Seeing as all my favourite eateries seem to have this quirk in common, I knew I’d struck gold with Confeitaria do Bolhão. It all began with the waiter grunting his displeasure at my not knowing that a ‘café com leite’ would be an espresso with milk. What I really wanted was a ‘café meia de leite’ – what would usually be an americano with milk. The Mercado do Bolhão is like a tiny version of Bombay’s Crawford Market, located within the atrium of an old building. Little shops line the isles, selling fruits and veg, sausages, cheese, bread, kitchen utensils, plants, crockery and other miscellaneous other bits and bobs. This confeteiria, is located just opposite the market’s entrance. It has a rather inviting display of typical Portuguese baked sweets like pastel de nata, bola de Berlim, etc. and some savoury croissants, bolo de carne and so on. Nothing you won’t get in any other little coffee shop in Porto really. Men stop here before work,old ladies catch up with friends after their weekly shop, parents bring their kids for a little treat, and the simplicity and normalcy of the atmosphere, I found, very comforting. 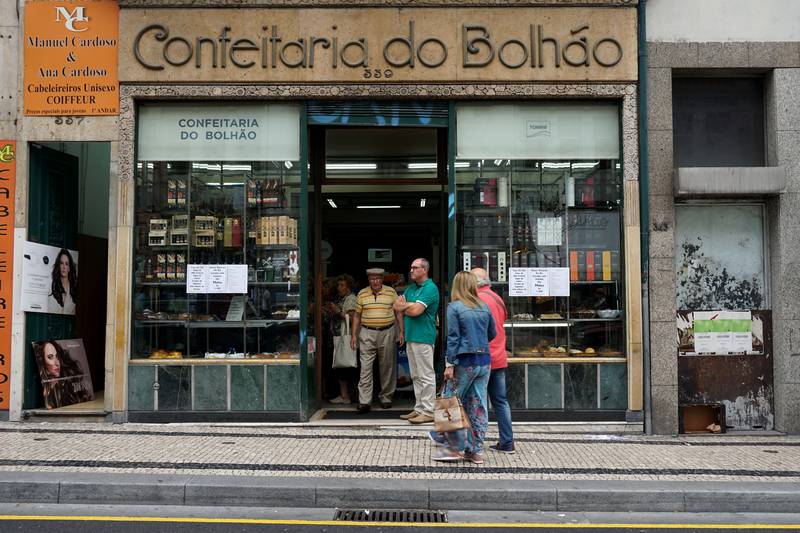 If I lived in Porto (or when), I imagine waking up early on a Saturday to shop at Bolhão, in no small part as an excuse to hang around at the confeitaria and have a little coffee and snack. I don’t know which is worse, the fact that I haven’t had a plate of fish’n’chips yet. Or the fact that I ate French food in London before I ate fish’n’chips. Anyway, I was strolling about Covent Garden one lovely evening last weekend in search of an Indian restaurant called ‘Chutney’. Before you begin to gasp in disbelief, let me clarify that it wasn’t my idea. Anyway, (thankfully) ‘Chutney’ seemed to be missing/closed on the day. 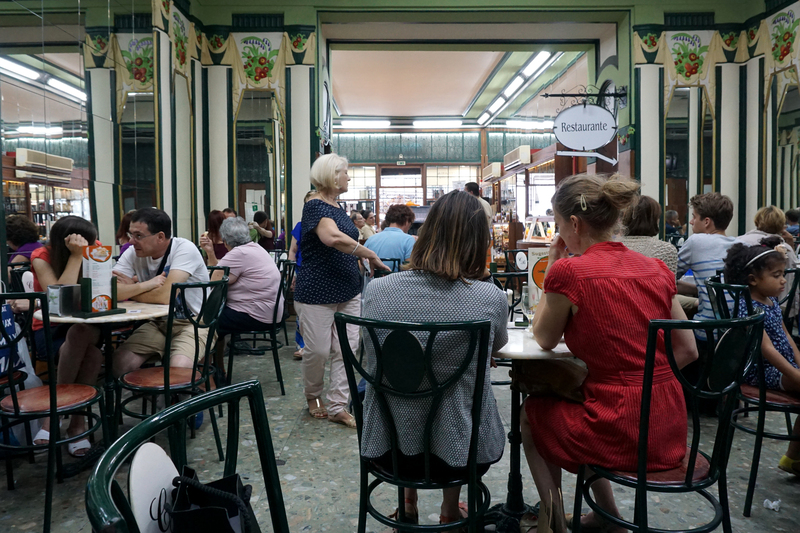 For lack of choice, because everything was crowded, I found myself sitting at a tiny little restaurant called Chez Antoinette and without too many expectations ordered myself a coffee and a platter of baked camembert to share with a new found friend. What followed was one of the most heavenly mid-afternoon snacks I have ever had! I fell in love with the fact that coffee was brought to our table in a mosaic of miss-matched cups and saucers, which looked like they’d been inherited from a mad old aunt. 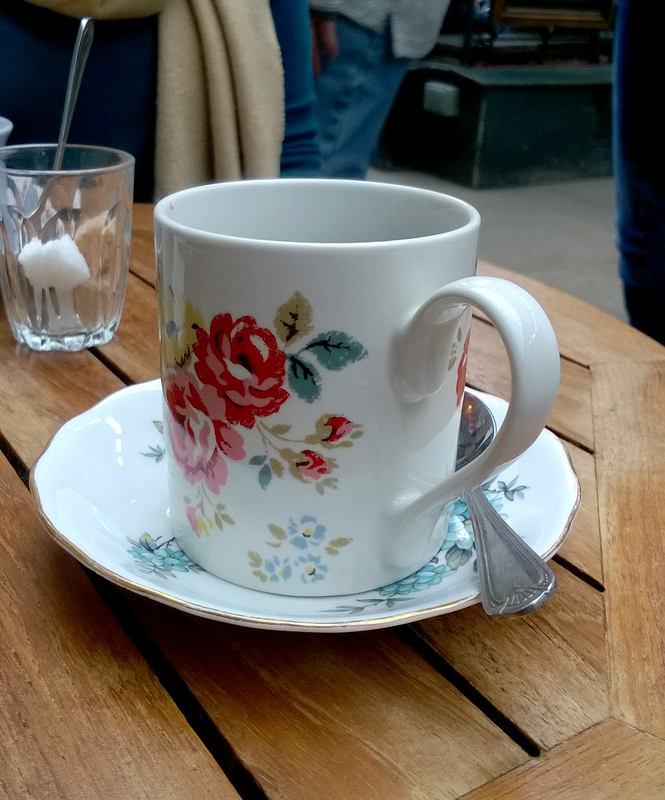 The coffee was superb, but the crockery was so damn cute, I could have very well had some tap water and gone home pleased. 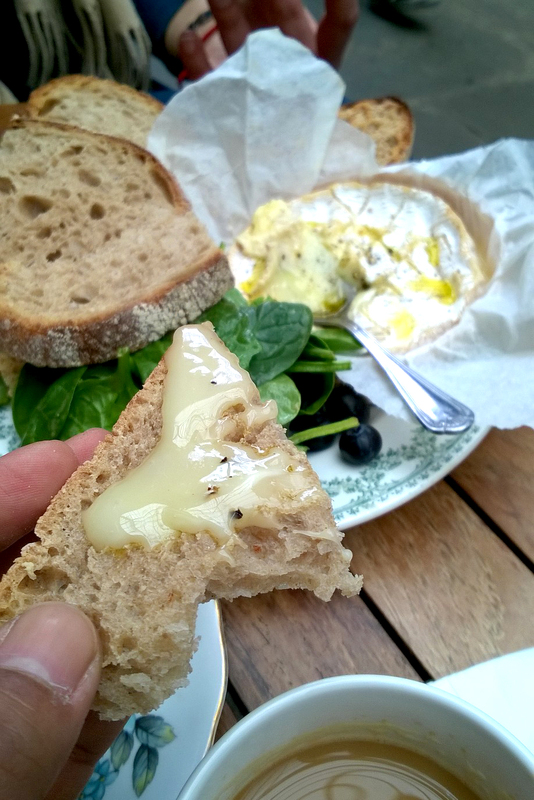 Anyway, the baked camembert was perhaps the finest I’ve ever had! Served with some crusty bread and a fresh salad that cleared the palette just enough for another morsel of pain et du fromage. By this point, I’d already planned a second trip, to sample other wonders Antoinette would serve. But she wouldn’t let me go just yet. 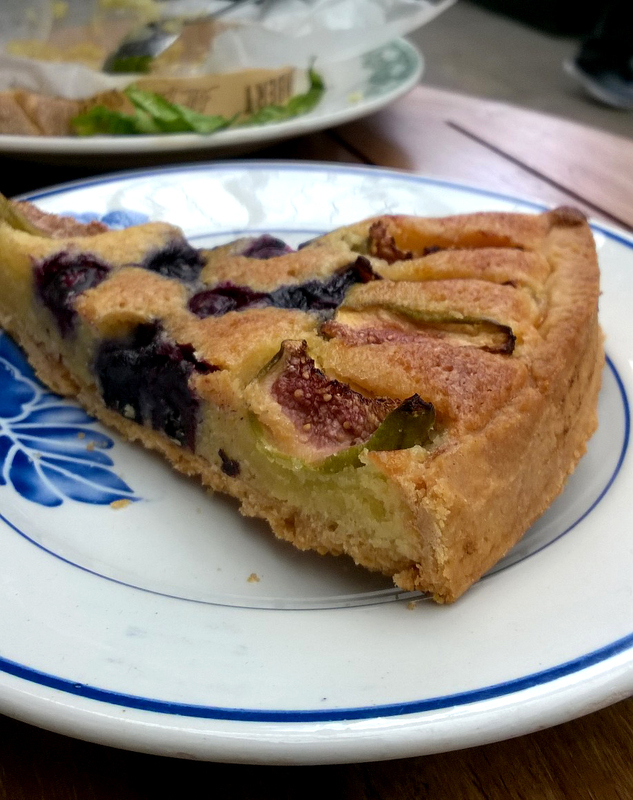 As fate would have it, a black board positioned right at my table kept hinting at dessert, tempting me with a description of a buttery tart stuffed with blueberries, figs and almonds. Could I ever resist such douceur? To say the least, no one does pastry quite like the French! There’s no proper way to eat a pie! Hello from London! I’ve eaten neither fish’n’chips or bangers’n’mash in my first few days at Britain. (gasp!) I’ve had me a good ol’ English pie though. 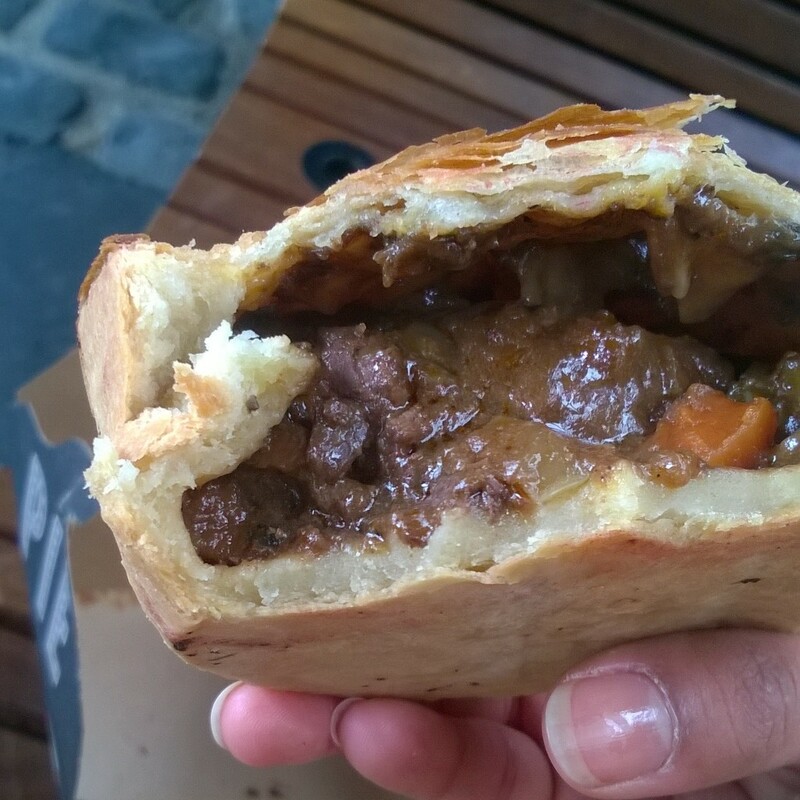 After a rather uneventful walk on the London Bridge I was determined to eat something quintessentially British, and made my way to the Pie Minister stall at the very busy Borough Market. They have a whole bunch of exciting pie fillings – some traditional (like the ‘Moo’ – steak and craft ale) and some just a little bit experimental (like the ‘light as a feta’ – squash, tomato & feta cheese). I chose something called the ‘Kate & Sydney’ which had a beef steak, kidney and ale stuffing. I’ve never been a big fan of pies but one bite of this one and I was sold. Maybe it had something to do with being in Britain, or maybe it was that crisp flaky crust with steaming rich filling that enveloped me in a warm hug on that cold winter morning. Yup, it was the latter! I’m on no gluten-free crusade, but I do find that consuming wheat (refined or otherwise) makes me feel a bit sluggish and bloated. So unpolished rice is my daily staple. Of late, I’ve decided to experiment with other grains like jowar and bajra as substitutes for rice. I was at the Bombay Local this weekend, and as usual spent some time at the Samskara stall having a chat with Hannah, who I’ve met a couple of times at such pop ups. I usually find something interesting at their stall. This time around I came away with Foxtail Millet. There were quite a few varieties of millet to choose from, but of course I went for the one with the funny name. Foxtail millets as they are. Fry the onions, garlic, green chilli and peppercorns in oil till they are slightly brown. Add the chopped beetroot and fry till they just about start getting soft. Then throw in the drained foxtail millets and salt. 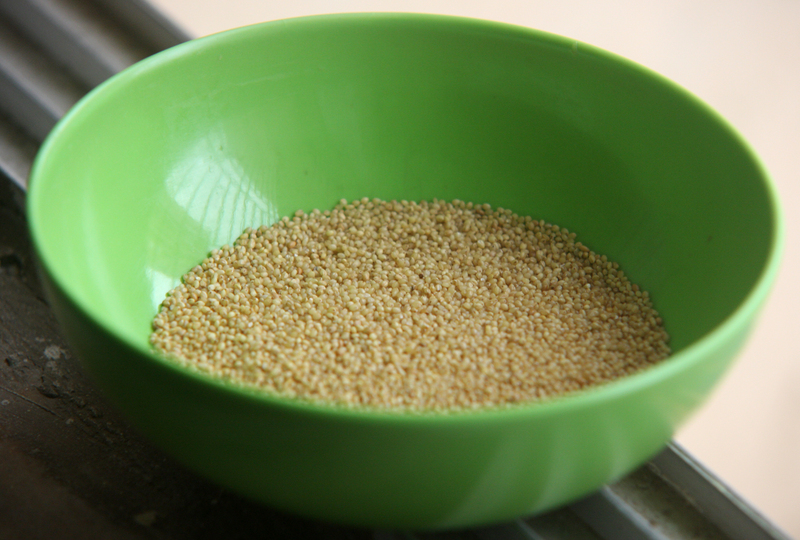 Allow the spices and salt to mix well into the millets – this should take a minute of tossing and stirring. Then, pour in the warm water, place a lid over the pot and wait patiently for just 7 to 8 minutes. Take a peek to see if the water has been absorbed by the grains. Don’t allow too much steam to escape. If the water is almost entirely absorbed put the heat off, place the cover back on and allow the millets to sit in the pot for another five minutes. During this time they will absorb all the remaining water and become super fluffy! 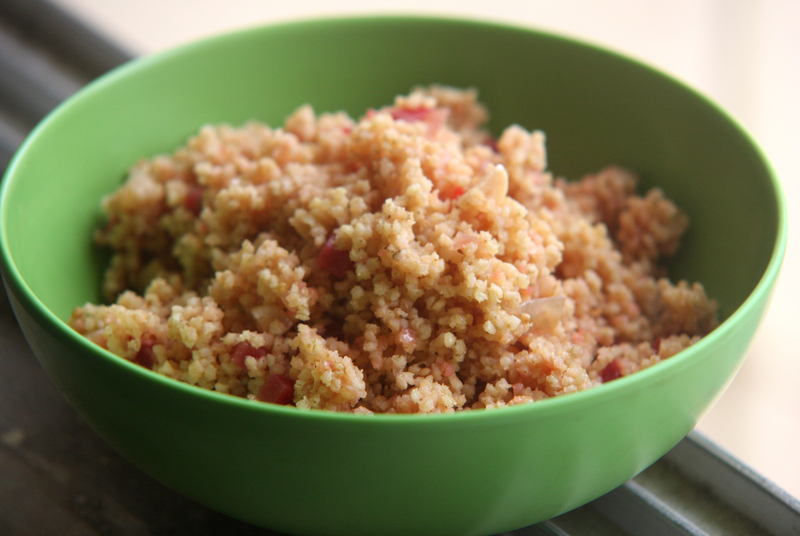 Just loosen with a fork and serve like you would pulao or couscous. You can use pretty much any vegetable, meat or masala to flavour these foxy grains!